On 12th July, 1988 The New D’Oyly Carte Opera Company opened it’s London season at the Cambridge Theatre in Seven Dials, Covent Garden. 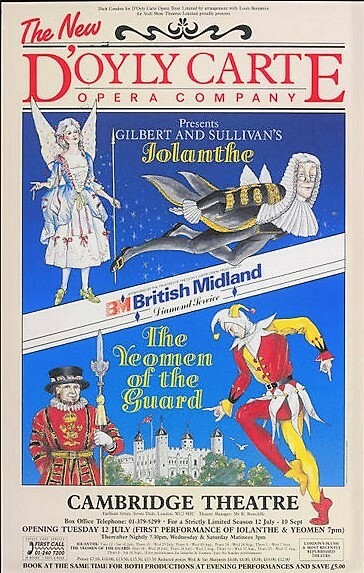 The season opened with “Iolanthe”on 12th July, with “The Yeomen of the Guard” opening on 18th July. The Music Director was Bramwell Tovey. The Season was sponsored by British Midland Airways with generous support from the then Sir Michael Bishop (now Lord Glendonbrook), whose generosity continues today.